Register Log In Primarily Petroliana Shop Talk Forums Known & Suspected Unmarked Petro Reproductions Standard No Smoking Sign. Real? I bought this at a flea market during the summer. It measures 24 inches long by 4.5 inches. To me it feels real but I want more experienced eyes to look at it. There is a small RACO stamp in the lower left corner of the sign. It sits inside a 4 sided diamond shape. I've attached a picture of it for you to see. What do you think? Real? 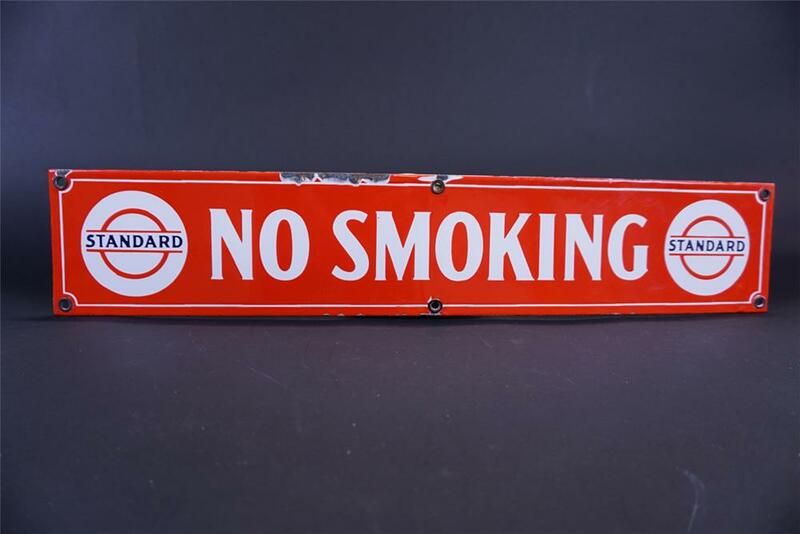 What got me wondering was after I saw another one of these signs sell for close to 600 bucks at Barrett-Jackson. The font is different than mine. You'll notice the tops of the letters have a slight drift off and the Standard logos have more space between the white border line. Is the one in the link below a fake or just another original variant? Last edited by TheHorse13; Tue Sep 26 2017 05:00 AM. Last edited by advertologist; Tue Sep 26 2017 05:22 AM. Will do when I get home from work today. From what I recall, the back looked proper for an old sign. It didn't have the fake rust, etc. There is yet another one on Ebay right now with lettering closer to mine but it doesn't have a RACO stamp. Last edited by advertologist; Tue Sep 26 2017 05:39 AM. Here are 4 shots of the sign in different areas. The grommets appear crushed from use, the metal pitted in a way that appears natural. Etc. Here is one more shot of the sign. It shows the RACO stamp on the bottom left corner. That's good to hear. The guy who sold it to me swore up and down that he took the sign off the gas station himself. He assured me that it was 100% legit but I figured that I would get some additional eyes on it to be sure.